Lesson: There will always be bumps in life...the important thing is to learn, move forward with your knowledge, and be thankful it wasn't worse. It was hard. Every little thing that happened felt like one more notch pointing out why this decision was a bad one. Not only were we going through the growing pains of learning how we worked in this new lifestyle, figuring out how we preferred to travel, and how to be mindful of the weather but it felt like our entire RV was falling apart too. We were soooooo discouraged. And then it all started to turn around. Things stopped breaking, started working, and we learned so much every day about living in our RV full-time. We were excited to finally have found our groove! We made a three month stop in Minnesota for the summer because it's where we're from and summers there are amazing. It was a great, but fast, three months and driving away filled us with sadness to be leaving the people we had reconnected with, but we were looking forward to our next adventure. We cruised easy through the Upper Peninsula, Sault Ste. Marie border crossing, and Ontario towards our Vermont campground. It felt good to be on our way and we were both in high spirits. We were heartbroken. Crossing the border in an RV is already a bit stressful because you just don't want to get stopped and have your rig torn apart. For us, it's not just stuff in our car, it's our home. This particular crossing had a weird angled approach and as got closer we could see all the scrape marks on the pole. Blair is a great driver so he swung out pretty far to avoid it but the angle of the approach and the narrowness of the lanes got us. We now have two basement doors that won't open, are dented, and scratched. My heart hurt for Blair because he was so frustrated and disappointed. The cherry on top though, and what caused my blood to boil, was that as we were both visibly upset and unable to get out and assess the damage, the border patrol officer says through his laugher, "Well, I've seen worse!". Seriously?! Really...it could have been worse. 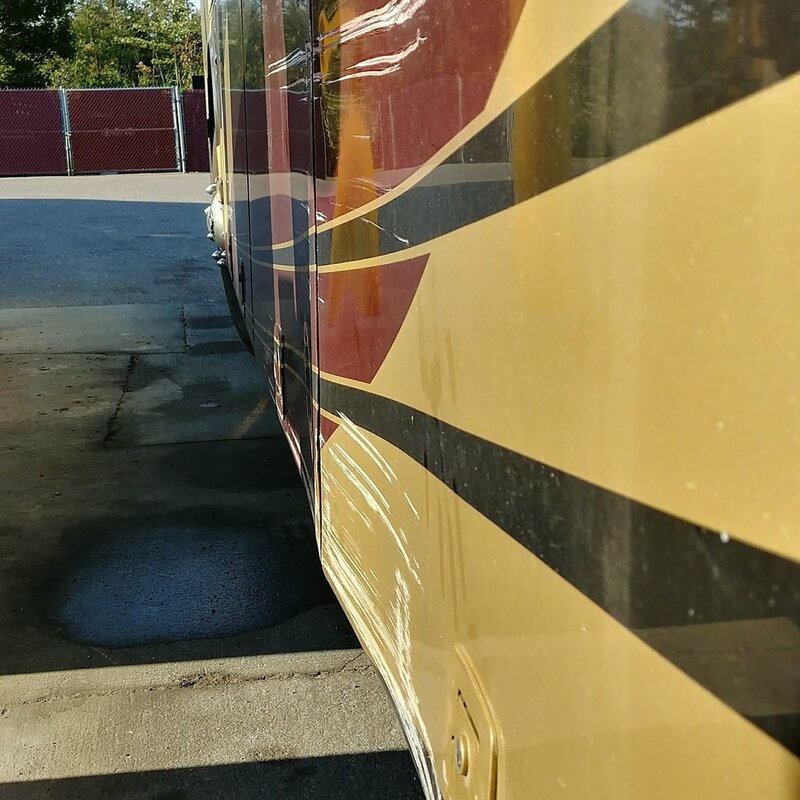 We could have literally gotten ourselves wedged into the lane, broken one of the surveillance cameras, or damaged the structural body of the RV instead of just the doors. It was bad, but it wasn't the worst. It is something we didn't think would happen to us, but we will forever have what we learned from it. We got "lucky" because the bins we use a majority of the time are on the right side of the basement and the damaged doors are on the left, so we've still got easy access to the stuff we use most. There is always a silver lining. You might have to search long and hard to find it, but somewhere among the wreckage there is something to be gained. Search for those small moments, the lessons, the silver...they are what will get you through the storm.